Despite the brutal weather and the threat of the worst snowfall in the US capital in some 90 years, His Beatitude, Metropolitan Tikhon, clergy and seminarians, and faithful from across the country took part in the annual March for Life here on Friday, January 22, 2016. Metropolitan Tikhon was accompanied by His Eminence, Archbishop Melchisedek of Pittsburgh and Western Pennsylvania, and His Eminence, Archbishop Michael of New York and New Jersey. Also participating were His Eminence, Metropolitan Evangelos of the Greek Orthodox Metropolis of New Jersey and His Grace, Bishop John of the Antiochian Orthodox Christian Diocese of Worcester. The March marked the 43rd anniversary of the Roe v. Wade decision that legalized abortion in the United States. Metropolitan Tikhon [far right] with [from left] Bishop John; Fr. Eric G. Tosi, OCA Secretary; Metropolitan Evangelos; and Archbishop Melchisedek during opening prayer. During the pre-March rally, Metropolitan Tikhon was among the hierarchs on the stage as Metropolitan Evangelos offered the opening invocation. Marchers representing the pan-Orthodox community braved the cold, carrying icons and “Orthodox Christians for Life” banners and signs. 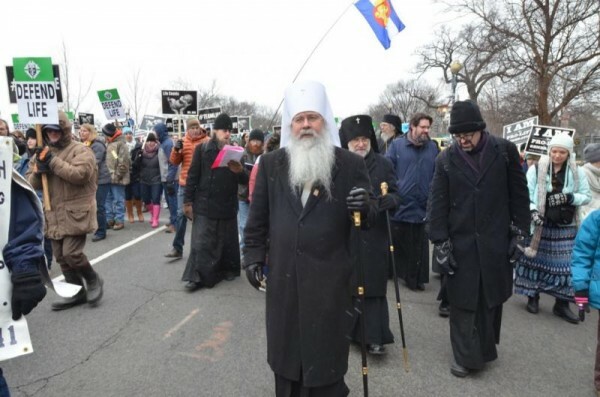 At the conclusion of the rally, marchers made their way to the US Supreme Court while Metropolitan Tikhon offered prayers for those who have fallen victim to abortion.